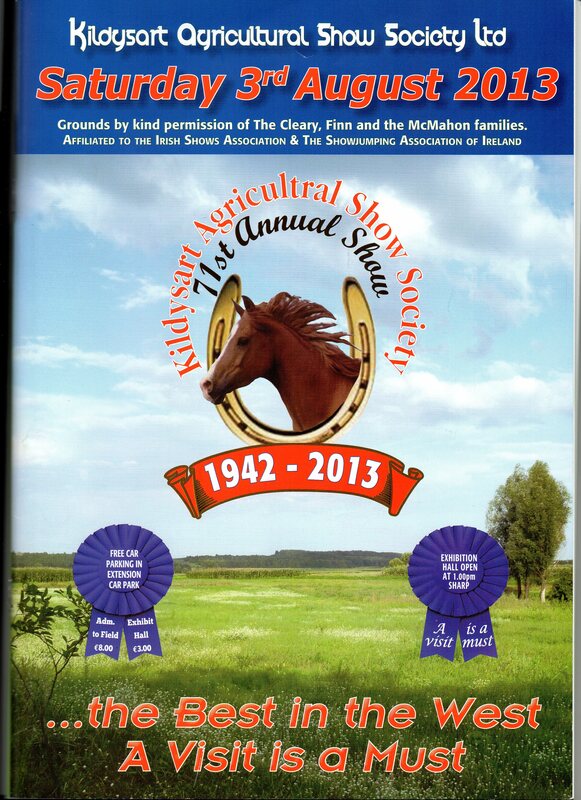 The 71st Kildysart Agricultural Show was held on Saturday Aug 3, 2013. It proved to be very successful Show with large crowds in attendance. Special attraction this year was the presence of two members of the Garda Mounted Unit. There were big entries in the Jumping competitions. The Shannonside League final and the Orchard Equestrian Young Rider Final created huge interest. Entries were good in the Showing Horse Section with the Kildysart All Ireland 2 year old filly final won by P.J. Lehane, Clonakilty, Co Cork. And the Dublin Coach Champion Young Horse going to Margaret Jeffers, Co Wexford.. The Clashmore Perpetual Cup went to Hughie Murphy, Co Mayo for the best Registered Irish Draught Mare. The Champion Mare of the Show was won by Kieran Fahy from Co Cork. In the cattle section the Commercial Champion was won by William R. Gubbins Co Limerick. John Moloney, Ardnacrusha won the Pedigree Champion of the Show. The were huge entries of high quality farm produce and home baking in the Indoor Section. The O’Doherty Cup was won by Barry O’Loughlin,Ennis and the Walsh Perpetual Cup was won by Niall Hannon, Kildysart for their entries in the Farm Produce & Horticulture section. In the Home Baking Section the Marbro Cup was won by Mary O’Sullivan, Kildysart, with the ICA Cup going to Tara McInerney, Kildysart. Maura Murtagh was the recipient of the Maurer Perpetual Cup. There was also a Vintage Display with the Threshing display proving to be a big attraction. There was a big turn –out for the Dog Show with the Champion Dog prize going to Sean Hehir, Lissycasey. The children enjoyed free bouncing castles and slides. See pictures on face book from exhibition hall and show grounds.